The mission of this section is to profile women in computer architecture across many walks of our field, from [junior, senior] x [industry, academia]. Welcome to Profiles of Women in Computer Architecture! 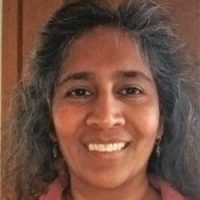 Dr. Srilatha Manne, known to everyone as Bobbie, is the general chair of the upcoming ISCA conference at the 2019 FCRC. She recently joined the Quantum effort at Microsoft, after having spent 4 years at Cavium as Principal Architect, where her most recent (and proudest) technical accomplishment is being part of the upcoming high-frequency multi-core embedded Cavium part, which she and a great team have been involved with from conception to (nearly) first silicon before she departed for Microsoft. Her specialty is power and microarchitecture, and she has also worked at a veritable who’s who of the hardware industry, from HP, to Intel VSSAD, and AMD Research. She began her career as an electrical engineer, and started working after her undergraduate degree in CAD. Within a few years, fearing being pigeonholed too early in her career, she went back to graduate school and got a Masters from UT Austin and a PhD from CU Boulder, where she pivoted to architecture in the last two years of school. She is a self-described bull in a china shop, and her best advice to any and all people who work in industry is to be the same. Not to cause damage, she clarifies, but if you see a problem, roll up your sleeves and attack it, and solve it. At the same time, she is a big believer in critical thinking and experiencing failure. “Failure is the process to get to success” she says. She has been a recent contributor to the SIGARCH blog, where my favorite post has been this one: https://www.sigarch.org/the-road-to-success-in-industry/. I first met Bobbie in her previous role at AMD Research, which was my first job out of graduate school and she acted as a wonderful mentor to me as I situated myself to life in industry. I remember my first impression of her was that she was very frank, and unafraid to speak her mind. It was such a contrast from what I could see from many women I meet – she is just totally unabashed in how she speaks. There is no “I was just wondering…” or “I’m sorry but….” or “I just wanted…” She speaks, quite frankly, like your average man. But I have found it so unusual for women to speak this way, and it’s very refreshing. My favorite story about Bobbie is about an internship she had at Intel while in graduate school. Her mentor was Doug Carmean, who at the time reported to THE Bob Colwell. Bobbie found the fact that interns at Intel were all stuck into cubicle bays, with multiple interns to a bay, very frustrating. Not only was there no privacy – most importantly, there was no noise privacy. Conference calls and conversations were all melded into a cacophony of intern-noise. So, much to Doug Carmean’s chagrin, Bobbie sent THE Bob Colwell an email and noted that there were plenty of empty cubes, and that Intel was not optimally using available space to get the best work out of their interns. This fearless “tell it like it is and let’s fix some problems” attitude is classic Bobbie – and it’s done her no harm, since her new boss at Microsoft is none other than Doug Carmean. When we worked together at AMD Research, I also found Bobbie to be a deep well of very detailed knowledge about power and microarchitecture. Nothing snuck by her – she caught every detail and would pin you to the wall until everything was figured out and hand-waving stopped. She credits the Joel Emer School of Architecture for this practice, as she says he trained her to be very rigorous in how she thought about problems. Additionally, Joel was also a great career mentor, as he was the first person who put her name up for things like program committee memberships and other such opportunities. Another important person in her career has been Rick Kessler, her manager at Cavium, whom she said not only got out of her way and let her solve problems, but simultaneously noticed and valued one of her “soft” traits that is very often unsung in our industry – the ability to bring people together and work as a team. The great thing about Bobbie is that she pays this forward – by pinning me to the wall at AMD, and noticing unsung traits in others (which may be why she works so well with other people). The lesson for Bobbie as a result of these experiences is that choosing the right manager is at least as important as the project you work on. Part of my reasoning for wanting to profile Bobbie is that she is one of the more senior women in our field, with a wealth of technical knowledge and experience, and high-profile enough to be the GC of the premier conference in our field. Yet when I speak to people at conferences, whether people know of her is hit or miss, and it is very generational. Younger people, who may not have read her papers from when they came out years ago, don’t know who she is. At the same time, during our conversation for this profile, Bobbie mentioned that many of the product engineers she’s worked with have been very helpful to her from both a technical and personal perspective. People who are nameless to the academic world, but who are the ones who have actually made a coherence protocol work in an deployed product, ones who have actually done the timing closure to ensure a certain frequency is hit, people who have all the tricks up their sleeves who make (some) of the crazy stuff we talk about in our conferences into actual viable products and have been doing so for decades – she found them to be a wealth of support and knowledge during her career. So while I have been thinking the research community needs to know more about Bobbie Manne, she has been thinking the research community could learn from our colleagues in product. Either way, it may benefit all of us to be a bit less insular. In her above-mentioned article above about success in industry, Bobbie says that networking is not about who you know, it’s about who knows you. I hope we know all know Bobbie a little bit better – not that she needs us to know her. With her new job at Microsoft and “let’s do this thing” attitude, Madame ISCA Chair is doing just fine. This website serves women in the field of computer architecture.